How much product is needed to treat 113 plants from 10 gallon pots ? There are a lot of factors that could determine this. Height of the plant, leaf size, trunk size, type of insect, etc. As a general rule, the label says to use 8 -16 oz per 100 gallons of water. This treats 20,000 square feet. This is also for agricultural purposes. 10 gallons of spray use .8 - 1.6 oz of product in 10 gallons of water. 5 gallons of spray, .4 - .8 oz in 5 gallons of water. The only way to know how much you will need is to know how much each plant will need. I would guess that it would only take a pint of mixed chemical per plant. Maybe a little more depending on how large, tall, wide, etc. So for 113 plants, you could start by estimating 113 pints or roughly 14 - 15 gallons of spray (8 pints per gallon). To make it easy, 15 gallons of spray would require about 1.2 oz for the low rate and 2.4 oz for the high rate. I would recommend to start with the low rate of 1.2 oz per 15 gallons of water and see what kind of control you get. 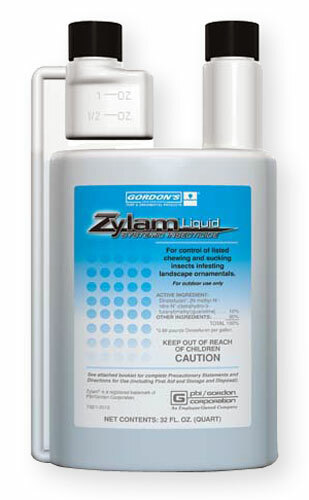 It's also highly recommended to use a surfactant such as Scrimmage and add this to your spray mix.